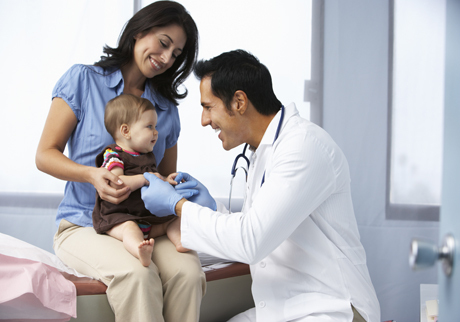 Your baby will have her first doctor’s checkup before she even leaves the hospital. According to the Canadian Paediatric Society, here’s what you can expect during her first checkups. · Is a healthy colour. Jaundice (or yellowing of the skin) occurs when babies have too much bilirubin (a product that results when red blood cells break down in the body). · Has received all necessary medications. This includes an ointment to prevent an eye infection common in newborns, as well as an injection of vitamin K, which is necessary for blood clotting. · Has wet her diaper and passed a bowel movement. This ensures there aren’t any blockages. · Has had all necessary screening tests. These check for certain diseases, including hypothyroidism and PKU (a disease where there is a deficiency in the enzyme that helps babies digest breast milk). In some provinces, additional screening tests are done. Ask your healthcare provider for more details. · Be weighed to make sure she’s a healthy size (your baby will likely have lost some weight, but that weight decrease should not exceed a 10 percent drop from her birth weight). They’ll also measure her head circumference. · Get checked for signs of jaundice. · Receive her first full medical exam where the doctor will listen to her heart and lungs to ensure they’re working normally and check her abdomen. Your doctor will also check in with you to see if she can help you with any feeding problems or other concerns.